The market players are expected to react to the better than expected factory output data for the month of August, which revealed that the industrial production grew by 6.4%. Benchmark indices closed lower for second straight day on account of profit booking after recent run up, with metal and information technology shares leading the fall. Further, weak performance among global peers also dampened investors sentiment. Meanwhile, markets participants are keenly awaiting the September 2015 quarter (Q2FY16) of the IT major, TCS. 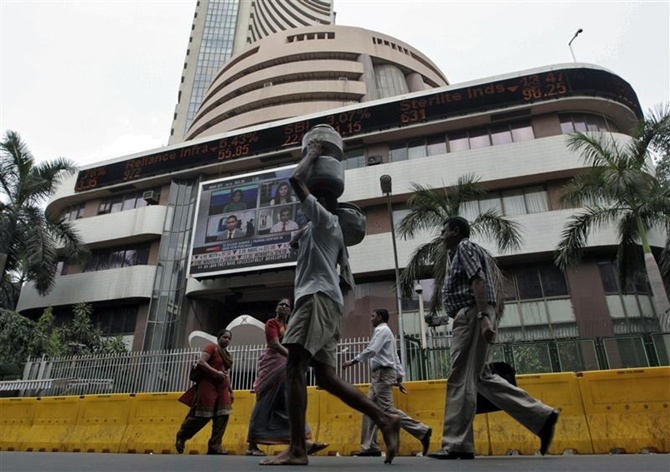 The benchmark BSE Sensex dipped 57.58 points or 0.21% to close at 26846.53 points while the NSE Nifty fell 11.90 points or 0.15% to end at 8131.70 points. The broader markets outperformed the benchmark indices- BSE Midcap index ended flat and the BSE Smallcap index inched up by 0.4%. Market breadth ended weak on the BSE with 1,535 shares declining and 1,232 shares advancing. On the currency front, the Reserve Bank of India today fixed the reference rate of the rupee at 65.0215 against the US dollar and 73.9164 for the euro. These rates were 64.7260 and 73.5999 respectively, yesterday. Further, India is in a goldilocks period of low inflation coupled with gradual recovery and the country is expected clock a GDP growth rate of 7.6% this fiscal year, says a report. According to Japanese financial services major Nomura, despite slowing external demand, the domestic growth cycle is improving. FICCI secretary general Dr. A Didar Singh said the growth in manufacturing seems to be accelerating and the coming months might see a transformation in the same trajectory. According to Ranak Merchant, Technical Analyst - Strategies of Sushil Financial Services, “The indicated target of 8,225 was met (week's high 8245), but indices failed to sustain above the same and slipped towards and below its 200 Day EMA of 8,183. The day's trade remained choppy with benchmark Nifty breaching the 8100 mark for a brief while." She further adds, “From current levels, the first support would emerge near 8068 (50 Day EMA) and hence the zone of 8,050-8,068, if held onto would provide good entry opportunity for a run to 8,225, once again. With the results season being kicked off yesterday, stock specific moves would be on the rise." Industrial Production grew by 6.4% for the month of August, an improvement over the 4.2% growth registered in the previous month of June, official data showed on Monday. However, India's retail inflation based on the consumer price index (CPI) for September increased to 4.41%, from 3.74% recorded for the previous month, on the back of higher food prices, official data showed on Monday. Chinese imports plunged 20% in September, casting doubt on the strength of domestic demand in the economy, while oil fell more than 5% overnight after a report that OPEC continued to boost production. The MSCI world share index fell 0.5%, its first fall in 10 sessions, ending the longest winning streak since February. The FTSEuroFirst 300 index of leading European shares was down 1.4% at 1,409 points, Germany's DAX was down 1.5%, France's CAC 40 was down 1.9% and Britain's FTSE 100 was down 0.9%. On Tuesday, Shanghai shares edged up around 0.2%. It was the index's fifth straight gain, a run not seen since July. BSE IT and Oil & Gas indices plunged by1% each followed by counters like Healthcare, Banks, Capital Goods, Consumer Durables and Auto, all declining marginally. However, BSE Realty index gained over 1%. The top losers from the Sensex pack were ONGC, Hindalco, Vedanta, Tata Steel, Infosys and GAIL. Metal and mining stocks edged lower after disappointing trade data from China for September 2015. Information technology (IT) shares continued to reel under pressure for second straight day with the Infosys and HCL Technologies falling 3% each on the National Stock Exchange (NSE). Infosys management on Monday revised its FY16 US$ revenue growth guidance down to 6.4-8.4% year-on-year (YoY) from 7.2-9.2% earlier, while keeping its constant currency guidance unchanged at 10-12% YoY. The stock of Infosys was down 3% at Rs 1,085, extending its previous day’s 4% decline on the NSE. TCS was down 0.3% on caution ahead of its September quarter earnings. The international consultant appointed to give its technical findings in a gas dispute between ONGC and Reliance Industries (RIL) submitted an interim report on Friday, stating around nine billion cubic metres (bcm) of natural gas may have flown out from ONGC’s block in the Krishna-Godavari basin to RIL’s adjoining reservoir. ONGC slipped over 3.5% while Reliance Industries lost 0.2%. Meanwhile, the sharp plunge in oil prices contributed to the decline. Hindalco dipped 3% after the Supreme Court on Monday asked the Central Bureau of Investigation to take necessary action in relation to cash, a diary and other documents seized from the premises of the company. Other metal shares like Vedanta and Tata Steel dipped on account of profit booking after recent upmove. Hindustan Unilever ended marginally lower. The company is scheduled to announce its Q2 September 2015 results tomorrow. On the gaining side, Coal India, BHEL, Bajaj Auto, Maruti Suzuki and ITC gained between 1-2%. Force Motors rallied 9% and also hit its lifetime high on the BSE on back of heavy volumes. Shares of Kellton Tech Solutions were locked in upper circuit of 10% at Rs 142, extending its three-week long rally on the BSE. Reliance Capital moved higher by 5% after the company announced that Nippon Life Insurance increases its stake in Reliance Capital Asset Management (RAMC) from existing 35% to 49%. Shares of Global Offshore Services dipped 20% to Rs 406, extending its previous day’s 20% fall on the BSE on back of heavy volumes. Shares of aviation companies were in focus on the bourses and rallied by up to 20% in an otherwise subdued market on expectation of higher profit growth for the second quarter ended September 2015. Jet Airways (India) was up over 12%. SpiceJet rallied 20%, also its fresh 52-week high on the BSE.